After extensive lobbying, here is board number three: The forces of Minas Tirith. This board aims to represent the first line of defense against Sauron and I have only added one unit to that seen in the movies: The Axemen of Lossarnach. I have tried to NOT have a unit entry for every single fiefdom but this the most varied list so far. Your Warlord is a Captain of Gondor. 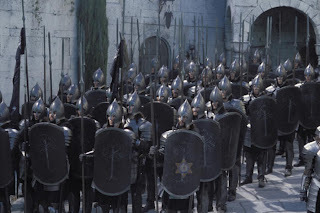 Your force may be composed of Elite or Veteran troops (Hearthguard) or Regular Warriors but (a small band of men from Anfalas, aside) the Armies of Minas Tirith do not generally feature levies. Guards of the Citadel: (1pt per 4) Armour 5, 2 attacks. Veteran Axemen of Lossarnach: (1pt per 4) Armour 4, 2 attacks, -1 enemy armour. Knights / Swan Knights: (1pt per 4) Armour 5 (4 vs shooting), 2 attacks, Move L. Mounted. 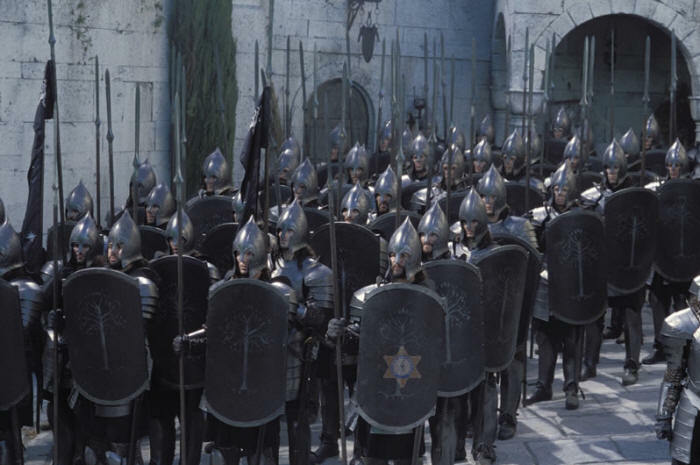 Warriors of Minas Tirith: (1pt per 8) Armour 4, 1 attack. May swap shields for bows (-1 armour vs shooting). Most Fiefdom troops can also be represented by these. Minas Tirith Cavalry: (1pt per 8) Armour 4 (3 vs shooting), 1 attack, Move L. Mounted. Axemen of Lossarnach: (1pt per 8) Armour 4, 2 attacks, -1 enemy armour. Rangers: (1pt per 8) Armour 4 (3 vs shooting), bows. Poochie is take take on my (half painted!) Isengard next Thursday with this list. Hope he likes it. Next up: Mordor. Board looks very cool! I will get the last of my Tirith boys ready for the fight. Couple of thoughts- What happens if you exhaust a troll, then use Dunharrow? I would still have been tempted by Lances for the Knights, but that is personal preference. Have been thinking I need to go back to the drawing board on the Trolls in a number of ways anyway, so wont be using one till that is done. I think now that a troll works better as a 2pt unit (and cave trolls as one point units). 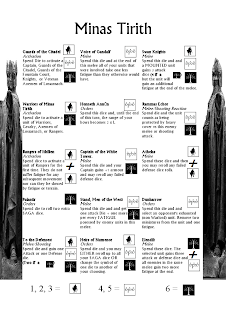 I know this post is older, but until now I always played the Hobbti / LotR SBG and just recently came up with the idea of playing a bit of SAGA. For I'm not quite used to the rules, please correct me if I'm mistaken. While reading the Forces, I asked myself, why anybody should play the Veteran Axemen of Lossarnach with 1pt. 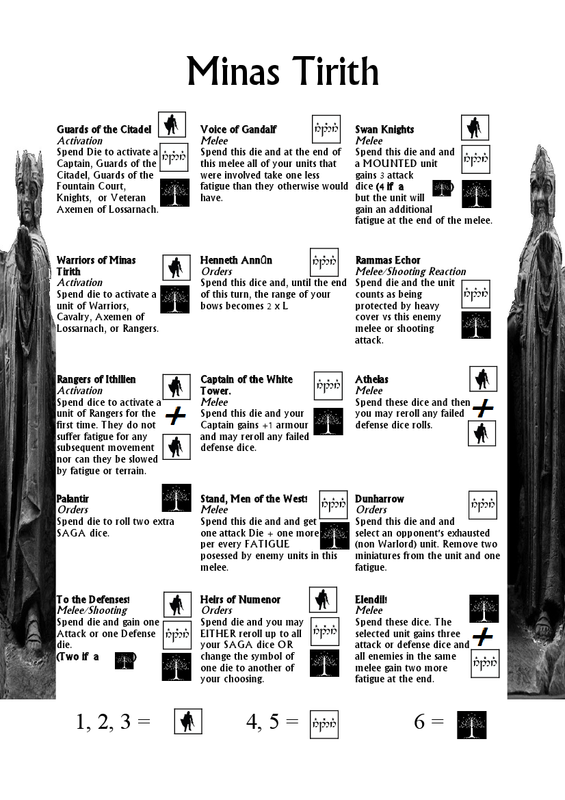 per 4, a defense of 4 and a total of 8 dice to attack, if one could get a unit of 8 Axemen with the same stats (1pt. , def. 4) but twice as many dice for wounding? Is it a mistake and you meant the Axemen to have 1 die each, or is there a rule I don't know yet? Hi Aule, yes that looks like it's a typo. Now for wrath! Now for ruin! And the red dawn!"